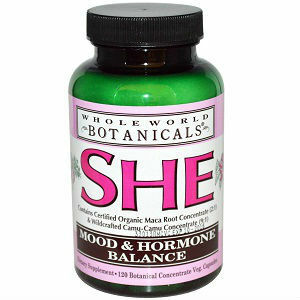 She is an herbal supplement indicated for the soothing of some menopausal symptoms, such as cramping, bloating, moodiness with mood swings and even hot flashes. Many of these symptoms that are commonly associated with menopause are due to the drop in estrogen levels during the menopausal transition. Myrciaria dubia– There is an insufficient amount of evidence showing that the ingredient Myrciaria Dubia can relieve you of depression and chronic fatigue syndrome. Maca Root- Maca Root has not been proven effective in the treatment of Female hormone imbalance, menstrual problems or menopause symptoms. Throughout all of the research we have completed, we have found that She has no recommended dosage listed anywhere on their site. The price of one bottle of She is normally $33.55, however, they now have She on sale for $28.51. This means that you can save $5.04 on each bottle of She when you buy a bottle of She. Each bottle of She contains 120 veggie capsules. She comes with a 45 money back guarantee. If you are not satisfied with She, simply return it for a refund. If you return the product used however, they will only refund 50% of the original item cost. If you are returning the product, shipping and handling are not refunded. The customer must also pay for the return shipping of the product. She uses a blend of ingredients that can be quite helpful to the body, however not every single ingredient is clinically proven to be effective, or beneficial for the treatment of menopausal symptoms. Jackie Horowitz	reviewed Whole World Botanicals SHE	on March 23rd	 and gave it a rating of 2.5.